"I have been using the VMAX600 in my Hobie Pro Angler for the past several months to power a Humminbird 788ci HD DI combo and lights when night fishing. The battery has exceeded my expectations in every respect. It arrived in a box with-in a box that was fitted with foam that conformed to the shape of the battery. Upon unpacking, I found that there was no damage to either the inner box or the battery. I have used this battery on trips lasting for four or five days where I fished several hours a day/night without having to recharge the battery. Under normal use, I leave the 788 on from the time I launch the kayak until I'm finished fishing. During night trips, I use a modified stern light mounted to back of the seat at all times and "under gunnel" LED light strips and a "Q-beam" as needed. 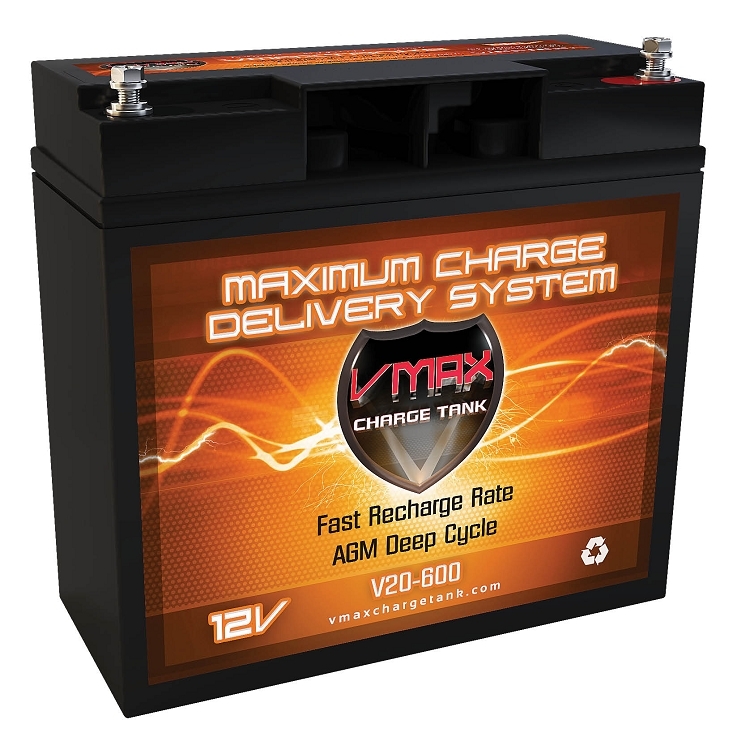 The VMAX600 is a well made higher end battery that I would purchase again without hesitation." "I am using this battery to power a 18 pound thrust trolling motor side mounted on a 10 foot kayak. The trolling motor uses 15 amps an hour on high speed (which is about 4 to 3.5 mph) and 7 amps an hour on low (about 2 mph). I have used a combination of both speeds ( 1/2 high speed 1/2 low) to travel 2 miles one way, and 2 miles back, and the battery seems to handle this nicely with no noticeable loss of power towards the end of the journey. I do not have a way to measure how far down this drains the battery, but I am calculating this to be about an 80 percent discharge, with each use. Using the VMAX BC1204 3.3A 4-Stage Automatic Microprocessor Controlled Battery Smart Charger / Maintainer for AGM, battery charger sold by this seller, I see the first green light flashing for about 5 to 15 minutes when I start recharging the battery, and the it stays on, and over the next few hours slowly works it's way up through the next 3 lights, which stop blinking and stay on, showing completed charge stages. Which I suppose seems consistent with an 80 percent discharge. The battery's small size and light weight (lower AHs) is necessary as I have space and weight limitations. This battery fits into my kayak in a battery box reasonably well, except for my inability to find a commercially manufactured, water resistant vented battery box that is not 2 times the size of the battery. As the batteries small size is one of it's big selling points, it would be nice if I could find a battery box to fit it. As it is, I am having to use a U1 sized box that is big enough for close to 2 of these. Getting the set up organized has been a learning curve involving a lot of trial and error, and I have only used the battery a few times. As with each use, I am discharging the battery down 80 percent (leaving only 20 percent of the original charge)I do not expect to get anything close to optimal use or battery life, especially as I am also leaving it sit a couple hours with a 60 percent charge (40 percent discharge) before the return trip, which then discharges it down to about 20 percent left. I have been reading that lead acid batteries really do not do well if they are left sitting, not being used to power anything, in a partially discharged state, and that regularly doing this for only a couple hours, without recharging, can be damaging. So I am not sure how practical this battery is going to be, for it's intended use, over time. If I am able to get anything close to the 300 charge cycles that this battery can supposedly provide if it is used hard, I will feel this has been an extremely good deal and well worth the price. Even if I can get 50 to 100 cycles from it, without it noticeably loosing it's capacity, it will be a cost effective power source for me, and I will be entirely happy with the bang I got for my buck. And if I burn the battery out before that, it is probably more about the conditions I am using it under, than the battery. I will try to come back and update this in a few months to a year, to report how this battery holds up to such stressful treatment. The seller has been both responsive and helpful in the areas where they can be, and so far the battery seems to be of excellent quality." "Not too much to say about this battery except that is is just what I was looking for in a small battery to be used for a portable solar generator. The battery is a deep cycle AGM battery that is said to be the best for such a use." "It feels like I have to charge it less than before, and the scooter operates better on this new battery pack." "Jumped a motorcycle that a 50A booster couldn't after filling two tires on a Xantrex portable unit."